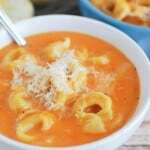 Creamy Tomato Tortellini Soup – delicious creamy tomato soup with cheese tortellini! Quick and easy, perfect for a weeknight meatless meal! Can we first talk about how Kate Gosselin and all 23 of her children are back on TV?! Last night was the best. I love them. And I know everyone says Kate is crazy but I even love her. My new favorite show. I recorded SO MUCH last night that it’s embarrassing. Oh Tuesdays, you’re finally interesting. Anyway, I made Creamy Tomato Tortellini Soup yesterday because it was really flippin’ cold and it wasn’t the fun cold that comes with lots of fluffy snow to go sledding in. It was the so-icy-that-my-husband-had-to-take-my-car-because-I-have-better-tires-and-four-wheel-drive kind of cold. I’ve always loved tomato soup – I used to have one of those Campbell’s drinkable tomato soups every single winter morning on the way to work. Because I needed something warm since my Camaro had no heat but there was no point in coffee since work was Starbucks. So I’d drink tomato soup at 4:45 am. You gotta really love tomato soup to do that. My kids have never really liked tomato soup though. So I passed it off as pasta with sauce and they totally dug it. And it literally took me 15 minutes to cook it from start to finish. Perfect lunch or easy dinner! Heat olive oil over medium heat. Add garlic and cook just until fragrant, about 1 minute. Add the tomato soup, milk, half and half, vegetable broth, and all the seasonings. Bring to a simmer. Once simmering, drop in the tortellini and cook according to package instructions (probably about 7 - 10 minutes). Serve hot with Parmesan on top. 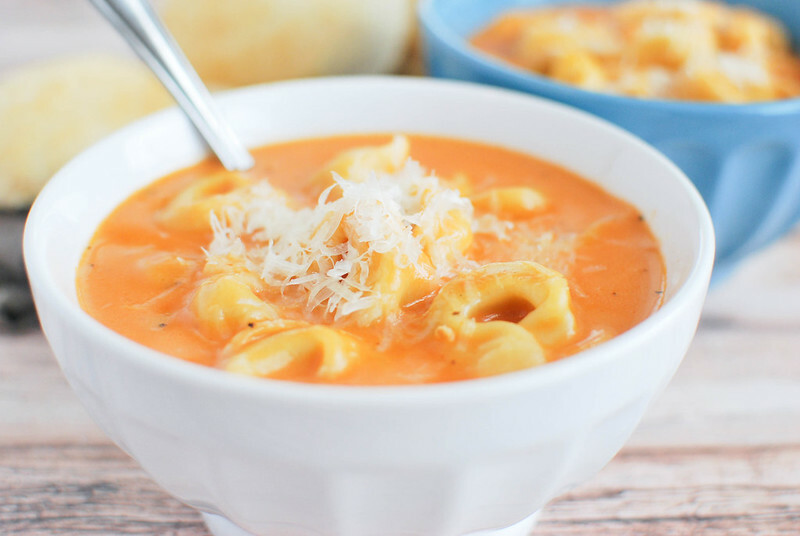 33 Responses to "Creamy Tomato Tortellini Soup"
This soup looks amazing. Yeah, it’s bitter cold outside. I think I’ll need at least two bowls. Pinned. I hate when the weather is bad and the hubs has to take my car. I always end up feeling trapped at the house for the whole day…and I hate that! Also, I used to be obsessed with those little tomato soups too. They were so good and so easy to make. BUT I think I might love this soup even more. That tortellini you added in pure deliciousness. You almost can’t improve tomato soup but it looks like you did… wow! Tortellini is the best thing ever! This looks wonderful! – oh and my favorite show Suits is about to be back on, I’m should be embarrassed about how obsessed I am with that show. 15 minutes? I’m in! Plus it’s so stinkin cold here, so soup is necessary! Perfect way to stay warm on these frigid days! Tortellini in soup is the best! I used to watch Kate Gosselin in her early years – I can only imagine what it’s like now that her kids are entering their teen years. Yikes. I think you inspired me to TIVO the show. Oh, and this soup of yours. . .delicious and AMAZING. I need a bowl of this before the end of the month. Yes yes yesss. I’ll make it. I make a version of this, but add spinach. And then my kids pick the spinach out. Um… love love love it! Yep, that’s what I need for dinner on this freezing evening! I love how easy this comes together and perfect for our MN cold weather!! I love your blog! How beautiful! Now THIS is my kind of soup! Love it! Tomato Soup is my favorite, although 4:45 am is reaaallly true love! My kids would totally dig this meal. My goodness this looks so tasty! Perfect comfort food! I bet my son would love this; I know I will. ;-) Pinning! Wow, you really love tomato soup!! Haha! This looks so delicious – nothing beats a bowl of creamy tomato soup on a cold day. It is the best! 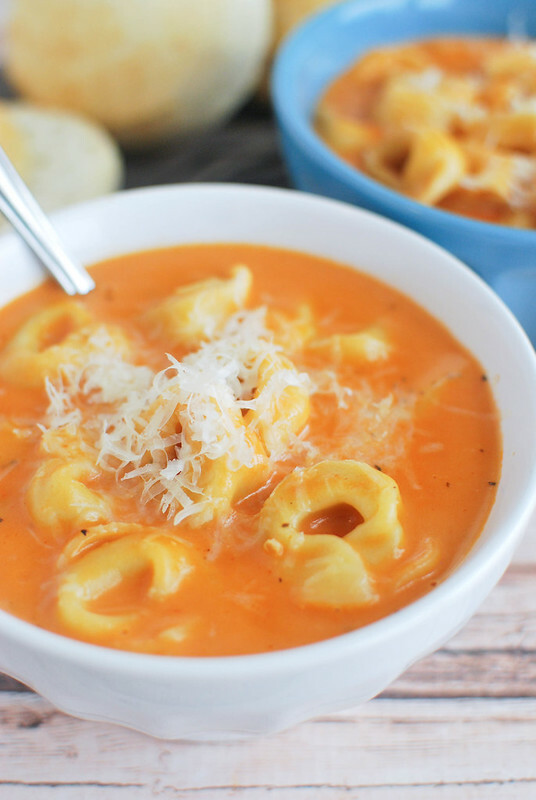 Tortellini sounds SO good right now, and there’s even tomato soup too! Looks so yummy! 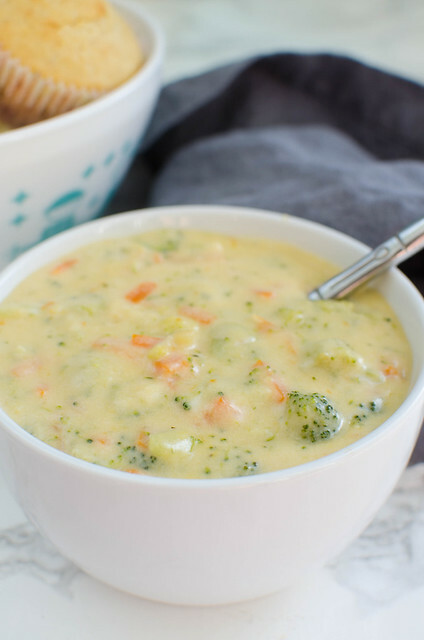 I’ve been craving soup non-stop and this looks like pure comfort in a bowl!! I have never heard of drinkable soups. I wonder what other flavors they have! I’m not a big tomato soup fan either, but I think would fall for the pasta with sauce trick too. This looks really good, Amanda! OH YES! 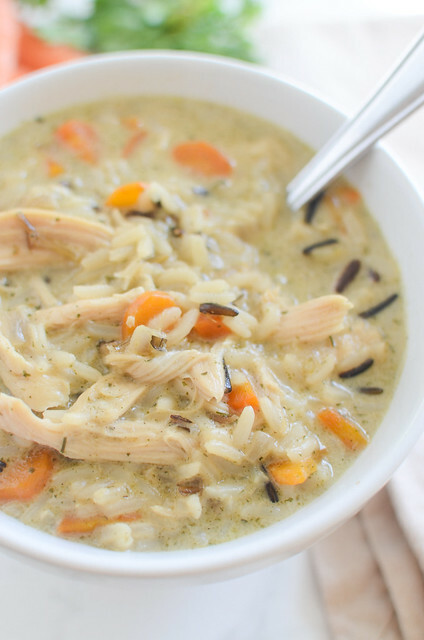 Totally love this soup! And I’m so picky about tomato soup. I like roasted red pepper and tomato soup and I like creamy tomato soup. But wowza, you took creamy tomato soup to the next level by adding tortellini. GENIUS! This looks amazing, how many does it serve? This looks amazing, how many does this serve? We made this soup last week when a friend & young daughter came over for dinner. It was a hit with both of our families! We had it for leftovers the next day couple days for lunch too. We doubled the recipe, used some local German Alpenmilch in addition to the half & half and MAN… it was AMAZING. I seriously can not wait to make it again! Thanks for the awesome recipe! 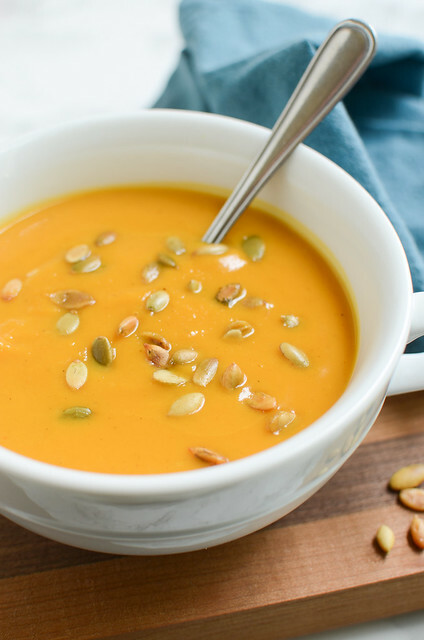 This recipe has become my go-to soup when I am stumped for an idea…It has never let me down…..I have prepared this for guests and for just my hubby and myself…….It is always a pleaser….and always a welcome offering…thank you for sharing….